For more than a century, Latin America has been an essential part of the global petroleum market. The region fueled the Allied powers during World War II and later served as a reliable source of oil to the growing economies of the now-industrialized world. Beyond supplying markets, Latin America served as a laboratory for oil governance structures, as a testing ground for industry exploration and production technology and as a stage for foundational discussions on oil production and ownership. Today, while the region is well-established as a key cog in the oil industry, it continues debating, changing, and developing. Broadly speaking, these debates and reforms have recently resulted in a structural shift away from state-imposed and toward market-required rules and modes. In the past two decades, countries in the region have begun allowing their state-owned oil companies more operational independence and have set clearer rules for non-public investment in the petroleum sector. This shift began in Peru towards the early 1990s and continued in Brazil by the end of that decade. Colombia made similar reforms in the early 2000s and Mexico joined the trend in 2013. This new landscape allows for far more competitiveness, transparency and efficiency, and it has the potential to yield better and stronger benefits to Latin Americans. This fundamental change in the Latin American oil market, of course, is now facing an immense challenge: a fundamental change in the global oil market itself. Rough estimates show that the value of Latin American oil production in 2016 was U.S.$155 billion - higher than Ecuador's gross domestic product (U.S.$100 billion) and slightly lower than Peru's (U.S.$189 billion). Yet only 3 years ago, this figure was U.S.$369 billion. This 58 percent decline is explained by two factors. The first is the collapse in crude oil prices from U.S.$100 per barrel in mid-2014 to a nadir of U.S.$30 per barrel in February 2016. Current prices are 50 percent lower than their average between 2011 and 2014 and much lower than the peak of U.S.$140 reached in the summer of 2008. This, of course, has yielded much lower revenues for the region's large petroleum exporters. For Venezuela, for example, oil export revenues - calculated as production devoid of domestic consumption and using West Texas Intermediate as a baseline for price - have fallen by around 70 percent from their peak in 2008. Between 2006 and 2016, oil export revenues in Mexico dropped from U.S.$47 to U.S.$8 billion - a full 91 percent. Ecuador's figures dropped 65 percent from their peak in 2008 while Colombia's decline reached 31 percent from 2013. The second factor is the steady drop in regional oil production over the last decade (Figure 1). Since 2005, regional production has fallen from 10.9 to 9.9 mbd. This means that, on a regional basis, Latin America did not take full advantage of the oil price boom of 2002-2014. Over this period, the real price of oil averaged nearly U.S.$80 per barrel. This price nearly quadrupled the previous decade's average real price of U.S.$32 per barrel and meant enormous revenues streaming into the coffers of large producers like Brazil, Colombia, Mexico or Venezuela. However, these funds did not go towards enhancing capacity to increase production and the result is that the region now produces less crude than in decades prior, despite not having dwindled its considerable reserves in any significant fashion. This decline in production is essentially explained by significant drops in output from the region's traditional oil powers: Mexico and Venezuela (Figure 2 and 3). For mostly below-ground and above-ground reasons, respectively, both countries registered declines in production of similar scales. In 2005, Mexico's output averaged nearly 3.8 mbd while Venezuela stood at 3.1 mbd. By 2016, both countries were producing an average of 2.4 million barrels per day. The drop in the case of Mexico was mostly caused by the geology and subsequent management of the country's largest field, Cantarell. The case in Venezuela is well known to be caused by gross mismanagement of the state-owned company, which has resulted in the loss of highly trained professionals and in the use of the company's resources for political purposes. There are, however, two trends diverging from the regional pattern: Colombia and Brazil (Figure 4 and 5). Partly because of redesigned governance structures that both countries adopted towards the turn of the century, output has increased dramatically over the past decade. Brazil, based on a more dynamic system which incentivizes investment and the incorporation of massive offshore reserves, increased output from 1.7 to 2.6 mbd. In 2016, Colombia's output reached 0.89 million barrels per day, nearly double its 2005 level of 0.53 mbd. Between 2013 and 2015, however, Colombia's oil production averaged slightly more than 1.0 mbd and output has fallen since then due to decreased investment because of the price decline. This overall decline in oil production and in the revenue it yields is taking place at the same time that the global oil market is undergoing a deep transformation from a model dominated by supply-side monopolies to one where competition establishes the rules of the system. The emergence of this new system was first made clear when the price of crude oil remained stable around U.S.$100 per barrel from 2011 to 2014, even though the prices for most other globally traded commodities had begun to decline because of slowing growth in emerging markets. This anomalous behavior resulted from a strategy executed by large producers - led by Saudi Arabia through OPEC - to maintain oil prices stable to keep market share. Over this period, this was made evident in circumstances when prices soared because of geopolitical events that disrupted supply lines. Large producers responded by increasing production and stabilizing prices. However, this artificially high and stable price level allowed for previously uneconomical oils to enter the market, particularly from shale oil formations in the United States. Towards the end of the last decade, oil production in the United States began to grow for the first time since the mid-eighties. In 2009, the U.S. reported year-on-year growth in crude oil production of nearly 0.4 mbd and in less than 10 years, the U.S. almost doubled production, from 7 mbd to 13 mbd. This incremental production in the U.S. has largely been carried out by companies in constant competition and consistently looking to gain efficiency and reduce costs. This is especially true in the case of tight oil, which is mostly extracted by hundreds of small, leveraged firms that lack the financial capacity to withstand temporary losses and must therefore be as nimble and economical as possible. In mid-2014 lower-than-expected global economic growth projections were released. As these met continuously increasing production from the United States, the price of oil began to decline in expectation of a potential glut. The collapse began in earnest in November 2014 after OPEC members refused to cut production as they had in the past to respond to the price decline. The market was flooded with more oil and fewer takers, sinking oil prices shortly thereafter. The logic behind OPEC's action was simple: to challenge non-conventional producers to continue increasing production while facing lower prices. Because of the drop, some producers did shut down operations and U.S. supply growth decelerated in the second half of 2015. However, after dropping to lower growth rates, unconventional oil production has remained stable and U.S. oil production averaged 12.5 mbd in 2016, slightly below its 2015 level. Without a large reduction in U.S. output, the price that had dropped to U.S.$30 in February 2016 stabilized during the second half of 2016 around U.S.$50. In November 2016, OPEC countries changed course and reached an agreement to reduce production by 1.26 mbd. Member compliance with terms of the agreement hovers around 95 to 100 percent. Prices, however, have not moved far from a steady level around U.S.$50 despite the OPEC reduction. The entry into the global oil market of crudes that are produced in a competitive environment has transformed the way in which prices are set. For most of its history, the price of oil was imposed on the market with varying ease by large and powerful supply monopolies. Between the mid-1930s and the mid-1970s, the preponderant monopoly was the International Oil Cartel, also called the Seven Sisters. Following the formation of OPEC in 1960 and a wave of resource nationalism in the Middle East and Latin America, the market came to be controlled by large OPEC-led producers. This pricing mechanism from large producers with monopoly power over oil supply lasted until the mid-2000s. OPEC's ability to control supply and set prices well above production costs meant huge revenues for the members of the organization and other countries with low costs. However, aside from producing windfalls for producers, these price hikes turned on economic basins that were known but hitherto too costly to develop, like the North Sea or the north slope of Alaska. The incorporation of crudes from these basins over supplied the market and in 1986 the price collapsed by 50 percent, from U.S.$50.69 to U.S.$25.71 per barrel in real terms between January and July 1986. The real price of crude would not pass U.S.$50 per barrel until May 2004, with the one exception from August to November 1990 due to the Persian Gulf War. With the entry of emerging economies like China and India into international markets towards the start of the century, commodity markets experienced a well-documented price super-cycle. Crude oil prices averaged U.S.$87.07 per barrel between January 2004 and December 2014, almost tripling the norm of the previous twenty years. The effect of this demand-driven price hike was the same as in the eighties: untapped but oil-rich basins became viable via technologies like horizontal drilling, deep-water extraction, or hydraulic fracturing that, because of high oil prices, became economical to use. These include the tar sands of Canada and the Brazilian pre-salt, but especially the crude trapped between shale rocks in the United States. In the U.S., this has allowed hundreds of private companies to produce high quality oil at ever dropping costs. In addition, shale oil reserves have been estimated at 78 billion barrels, allowing for a very long-term time horizon of extraction. Combining these factors explains how any increase above the cost of producing unconventional crude in the U.S. will encourage the drilling of hundreds of wells in shale formations and a re-increase in supply. In practical terms, a pricing mechanism based on competition, a novelty for oil economics, is being established as the market is using the marginal cost of marginal producers as an equilibrium price, thus eliminating monopoly profits for lower-cost producers permitted by the previous system. The consequence of this for Latin America is grave. The halving of oil prices has had serious economic effects throughout the region. Towards the brighter end of a gray-tone spectrum, Mexico, the region's least oil-dependent large economy, grew at 2.3 percent in 2014 and in 2016, while Colombia's growth rate dropped from 4.4 percent in 2014 to 2.0 percent in 2016. More worryingly, Brazil and Ecuador moved into recession with growth rates dropping from 0.5 percent to -3.6 percent for the former and from 4.0 percent to -2.2 percent for the latter. Venezuela has felt the price collapse most strongly. The Venezuelan economy had already contracted by 3.9 percent in 2014 when the price drop began. By 2016, the contraction almost quintupled to 18 percent. 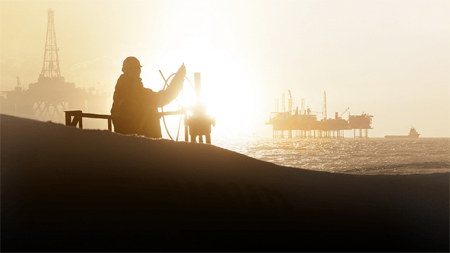 Beyond declining production and reeling under the impact of the price collapse, the Latin American oil industry must overcome other important challenges to its sustainability over the long term. The first is navigating a pricing scheme that is unlikely to pick up over the next five years. This will mean reduced profits for companies and revenues for states and will force both to make important adjustments: operators must find savings and cost-cutting measures while states should make up for decreased oil tax revenues from elsewhere. This is an opportunity for companies to improve productivity and focus on profit-generating activities and for states to improve tax collection - generally low throughout the region - and to reduce costly and inefficient subsidies to fuel consumption that are generally regressive. The second challenge is operating within a market structure that is much more competitive than the structure that governed the market for almost 30 years between 1986 and 2014. No longer will state-owned companies like Petrobras, Ecopetrol, or Pemex operate with huge profit margins and little scrutiny, a combination of factors that often incentivizes corruption and mismanagement. Instead, they will be forced to operate much more efficiently and profitably as they are in effect competing with the price-setting marginal producer in the global oil market, the small and nimble shale oil operator in the fields of Texas or North Dakota. Brazil, Colombia, and Mexico have already arranged their institutional frameworks to allow for increased competition and more transparency. and other countries, like Venezuela or Ecuador, would do well to follow a similar pattern. The lower oil price schemes are then but a very strong incentive to deepen the drive towards optimized and competent management. A third obstacle is to continue generating revenues and profits from a market that will grow at slower rates. The price boom of the 2000s was mostly a result of fast-growing demand from fast-growing economies like China and India. As these countries transition to more mature economies, their growth rates will drop - as they already have in the case of China - and demand for oil will be smaller than the Latin American producers have become accustomed to over the past two decades. With demand for oil in the industrialized world already flat, a slowdown in demand from the developing world will challenge Latin American producers to find and maintain market share for their exports (Figure 6). A related challenge is the continued growth in demand from within the Latin American market that along with declining crude oil production has the potential to turn the region into a net importer for the first time. In 2005, Latin America produced about 3.6 million barrels per day more than it consumed. By 2016, that number had dropped to 1.1 mbd, mostly because the decline in production outlined earlier but also because of continuously increasing demand. Alongside this declining balance is the fact that the region has not added to its refining capacity in any significant way for the past decade, increasing its reliance on extra-regional refining facilities - like those in the U.S. Gulf Coast - that are used by Mexico to refine Mexican crude. More long term, it is essential that we keep in mind that the region remains too dependent on oil for export revenues - reaching nearly 99 percent in the case of Venezuela and surpassing 50 percent in Ecuador and Colombia - this at a time when technological developments in the industrialized world have the potential to upend the transport market, the oil industry's main customer. Finally, the region faces a double-edged challenge: environmental concerns that are largely generated by the same oil that sustains the region's economy. While Latin America is not an historically significant contributor of greenhouse gases, it is vulnerable to rising sea levels, unpredictable weather, and volatile water basins, which are particularly concerning in a region as reliant on dams for electricity generation. In closing, instead of waiting for a miraculous rise in prices, Latin America would do well to accept the price collapse as a structural and permanent change in the international energy market and, based on this, manage its oil markets from a different perspective. Importing countries like Chile, Costa Rica, Uruguay or the Dominican Republic will be able to decide whether to transfer lower fuel costs to consumers or retain the difference as a new, more progressive tax for income distribution and more conducive to energy conservation and the reduction of greenhouse gas emission. The producers face a greater trial: to make structural reforms necessary to adapt to this new oil reality. As argued, they must make fiscal adjustments to accommodate the decline in oil revenues. As it is permanent, this reduction needs to be compensated by structural measures, either through public expenditure or increased revenue from the non-oil sectors. As a counterbalance to this adjustment, cheaper oil creates conditions to eliminate subsidies offered to domestic consumers, which are regressive, as the higher income sectors consume more than the lower income sectors. This new scenario offers another opportunity: it is an ideal time to create savings and stabilization funds. As forward-thinking nations like Norway do, Latin America's oil-exporting countries could put away extraordinary income generated by sudden price increases and use them to compensate for any unplanned drops or invest them for future generations. Far from a threat, this new oil model - one based on competition - offers an excellent opportunity to move towards a more stable and rational development pattern. Surpassing the obstacles we have outlined will required level heads and long-term thinking. The region has taken important steps but it must not rest on its reformed laurels. It must keep an eye on the international oil industry, generally a step ahead of policymakers, to determine how to design structures that will strengthen and maintain Latin America's history as a driving force in the global oil market. Ramon Espinasa is the lead oil and gas specialist at the Inter-American Development Bank (IDB) and the General Coordinator of the IDB's Extractive Sector Initiative. He is also an adjunct professor of energy security at the Georgetown University Edmund A. Walsh School of Foreign Service. Carlos G. Sucre, an extractives sector (oil and gas) consultant at the Inter-American Development Bank. Petroleumworld does not necessarily share these views. Editor's Note: This commentary was originally published by ABO, 06/16/2017. Petroleumworld reprint this article in the interest of our readers and does not necessarily reflect the opinion of Petroleumworld and its owners. All comments posted and published on Petroleumworld, do not reflect either for or against the opinion expressed in the comment as an endorsement of Petroleumworld.